When you arrive, the King of Red Lions will teach you how to use the Wind Waker, a magical conducting baton, much like the Ocarina from Ocarina of Time. On the Wii U HD version, use instead to get your baton out and use both and to get the timing and direction of the song your conducting. Head straight and pass through a tunnel. You'll be on a shore. Swim across to the small island and walk to the slabs of stone on the island. Engraved in one of them are notes for a song. 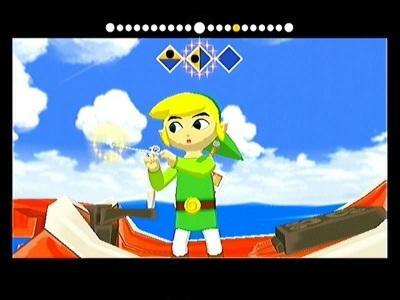 Equip the Wind Waker and play the notes. You'll learn the Wind's Requiem which is simply controlling the wind. You'll meet one of the frog's who ask you to look out for his brother that use the tornado which you're under prepared for now. Link learns the Wind's Requiem. Head left and you'll see some blue bomb flowers. Use them to blow up the rocks that block your path. When you reach the top, you'll have to sidle the wall to get across the broken bridge. Drop one more bomb flower and continue on. You'll meet up again with Quill. He'll invite you to enter the island, so do. The Rito tribe will tell you of their problem with their wing-giving dragon, Valoo, and that he has become violent and angry. They ask you to help Prince Komali, the chieftain's son. Quill will give you a Delivery Bag, for holding letters. Take Quill's advice and look for Medli in one of the upper rooms. She'll give you a letter to Komali and she'll also ask you to meet her later. It's not a date. I promise. Head down to the bottom floor and enter the hallway leading to the Prince's room. In this room, Prince Komali will be sitting in bed holding Din's Pearl, but he won't give it to you. Deliver the letter and leave his room. In the main room, go through the door with the feathers above it. 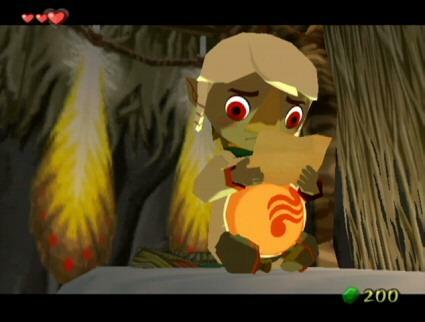 Prince Komali holds Din's Pearl. Out here, jump down to find Medli. She'll talk to you, and then ask you to throw her up onto a ledge. Pick her up and go to the top of the little hill. When the wind blows towards the ledge, throw her towards it and she'll fly up there. She'll give you a bottle for your efforts. Note: For some fun, you can throw her on to a wall and she'll say funny things before begging you to throw her to the ledge. Experiment to see what she'll say while the birds are chirping! Head over to the center of the room by the rock that has water around it. Equip your bottle and grab some water with it. 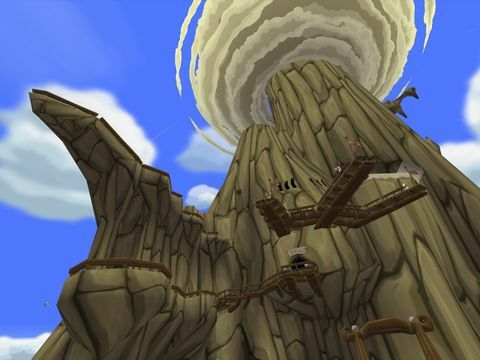 Climb back up to the entrance to Dragon Roost Cavern and pour the water on the red withered bomb flowers to turn it into one you can use, then throw one down onto the rock below. This will create a lake so that you can swim and follow Medli into Dragon Roost Cavern. Throw bomb flowers into the pots that the statues hold, and they will fall over and make platforms that allow you to cross the lava. Note: throwing bombs into the statue can be difficult so do your best to line up the distance and angle correctly before picking up a bomb. It may take a couple of tries. The next area is your first sword-equipped dungeon: Dragon Roost Cavern. This page was last edited on 2 March 2016, at 14:14. This page has been accessed 47,184 times.